D-Link for Business? Yes, That’s a Thing. Yesterday, I was briefed by the good folks at D-Link about their managed Ethernet switches. If you’re like I was, you think of D-Link purely as a consumer-grade line of switches aimed at home users. Reality is that D-Link also has managed switches that are worth evaluating for the small-to-medium sized enterprise. Why? Let me hit the highlights. 1. Performance. Reportedly, D-Link is winning some enterprise deals because their kit is succeeding in raw performance bake-offs against some other, more well-known products. Performance testing with Ethernet switches can be a tricky business. Application burst behavior as well as the mix of frame sizes can impact raw throughput, and not all Ethernet silicon is created equal. Therefore, I accept this claim. It’s entirely plausible that for a given application, one switch out-performs another. 2. Features. For several of the managed switches in the line, D-Link has a long feature set, including OSPF, Q-in-Q, MSTP, private VLANs, PIM (all modes), solid IPv6 support, and BFD. I’m hardly listing the entire feature set, and there’s really a surprising amount of functionality. Read through the specifications tab on this data sheet to dig deeper. Also note that, similar to Cisco, some of these features are enabled via a license; D-Link managed switches are purchased with either a standard or enhanced image. 3. Broadcom chipset. The D-Link managed switch line is based on Broadcom merchant silicon, just like many other switches you might be more familiar with. This is not Trident 2 gear, which is found in super high-end data center switches, but my point is that it’s Broadcom silicon. Not something lower end or otherwise disreputable. Not a rebranded consumer-grade switch. 4. Large install base. D-Link claims that they are number 3 — behind Cisco and HP — in the number of Ethernet ports shipped. That statistic by itself isn’t overly meaningful except to point out that D-Link is a volume manufacturer who, at least inferentially, has a handle on quality control. You don’t ship that many ports by selling unreliable gear. I don’t repeat-buy junk, and I suspect you don’t either. 5. Support. 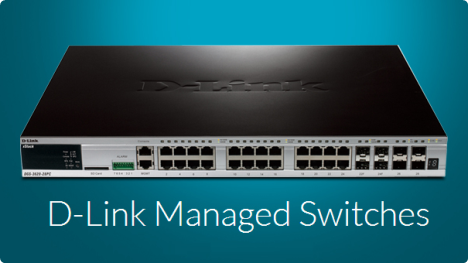 When you purchase a D-Link managed switch, it comes with an NBD replacement, lifetime warranty. If you want additional support, you can purchase a contract for 24×7 coverage and 4 hour replacement. In the US, D-Link services replacements via 40 equipment depots. If your curiosity is piqued, you should also know that D-Link has initiated an evaluation program for their managed switches aimed at businesses who want to give the gear a workout. They’ll ship the gear to you. You put it through its paces for 30 days. Then you ship it back. This is unlike some evaluation programs I’ve been a part of where the vendor wants you to sign a PO to “evaluate” the gear, and then cancel the order if you don’t want it — a big headache for everyone. The way D-Link described the program to me, it’s as straightforward as it gets. D-Link has stronger gear than I was expecting (including a line of chassis switches), but that doesn’t mean these switches are big-iron data center monsters. They aren’t. They just don’t have that much TCAM, and thus maximum routing table entries, ACL entries, and MAC entries aren’t that high. Are they high enough? For many organizations, there will be more than enough TCAM, and remember that D-Link is going after the small to medium sized enterprise market — not cloud providers. In any case, don’t overlook the TCAM aspect when evaluating. D-Link configuration is something else that will need to be evaluated. While some of the D-Link gear has an industry standard (Cisco-like) CLI, some does not. D-Link tells me they have a command translator cheat-sheet, much like Cisco themselves do for folks moving from IOS to NX-OS based gear. But evaluate carefully the operational impact of learning a new CLI. D-Link tells me that the long-term roadmap is for all of their gear to consolidate around a Cisco-like CLI, but that’s not where things stand today. That’s actually a really interesting post. I have a pretty good idea of what to be buying for the larger end vendors (when needed), but I have always been somewhat hesitant installing the smaller to mid tier switches due to a lack of experience with them in the real world. Or actually in all honesty, not really being able to properly evaluate them. Great to hear about a ‘second tier’ vendor for a change. My tip to D-Link, forget the Cisco-like CLI, build something better, better yet, leave that alone and build a great REST API instead. I’m starting to find it odd that the CLI is still an operational consideration. Fair, but your head is where the ball is going, not where it’s at. And if you think about the most likely D-Link managed switch consumer, what are they likely to do with a REST API? I think for this specific market (SMB), CLI & GUI will be the configuration tools of choice for years to come until someone provides a better way that’s got a shallow learning curve and is easy to consume. And now that I think about it, I don’t know that D-Link *doesn’t* have an API of some sort today. I actually have no idea. That didn’t come up in the conversation. A good follow-up question to ask. It’s interesting because D-Link did tell me they have a lot of success in the embedded marketplace, which I can see lending itself to API integration with a larger system rather well.